Faith IS Action at Cold Spring Church! Suppose a brother or a sister is without clothes and daily food. If one of you says to them, “Go in peace; keep warm and well fed,” but does nothing about their physical needs, what good is it? In the same way, faith by itself, if it is not accompanied by ac- tion, is dead (James 2:15-17 (NIV)). Well, you’d likely begin by describing our worship together on Sundays at 10:30 a.m. in our well-known red brick building, our Worship Center. Worship includes welcoming and engaging activities such as singing, praying, re- sponses, Scripture readings, and the preaching of God’s Word. In worship, whether in our personal devotional time or together, we express our gratitude and praise to God and become energized and equipped to make a positive difference in the world. But there is more to Cold Spring Church’s mission than corporate worship on Sundays. Much more. As I left the Wawa on Bayshore Road the other day, there was a Prescription Drug Drop-Off zone that urged parents to clear out dangerous and unneeded drugs from their medicine cabinets. I wonder if we could provide prevention training in partner- ship with the New Jersey Opioid Program, or space for classes to help Parents learn how to better monitor and support their kid’s activities? As we keep listening, we also recognize that some in our community have had traumatic or painful experiences related to God, religion, de- nominations, or churches in general. Our Explore God series provides a safe place for inquiry and sharing. How many have become disillusioned by religion, disappoint- ment by bad-actions associated with Christ or the practitioners of the Christian faith, or simply lack hope that their faith could once again become more meaningful and alive. While we are welcoming, our neighbors may need something more as they seek spiritual energy, hope, and possibilities. As we move into the holiday months of Advent and Christmas, let’s renew our commitment to be more than just welcoming and more than just worship. How can we practically address urgent community needs and partner with others by learning and listening, loving and serving, inviting and building discipleship, and becoming a pro- active champion for our greater community? Of course, we still will gather for worship, but if all we do is worship on Sundays, we will miss even greater weekday opportunities God has set before us to do (John 14:12). What connections can you make in your neighborhood? How can we help? Think about those who may need an encouraging phone call? Think about the teenage skateboarder you see on the corner, the family next door, the person walking down your street every day, or your favorite store clerk? Many have not been in a worship service recently, or ever. They may not want to, either! Realize that our world of favorite songs, sermons, and prayers will be unfamiliar to them, not make any sense, and they may feel more like outsiders. What activities does our community enjoy? Pet lovers? Hobbyists? Community- minded volunteers? How about connecting to others around art and food? Studying the Bible? Homework help? Youth activities? Senior respite? Any car or motorcycle en- thusiasts? Outdoor fans? These activities can create natural connections that can be nurtured at Cold Spring Church. Our community of faith has held fast to core Christian theological beliefs since its founding by followers of Christ in 1714. 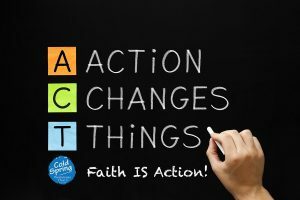 Let’s recommit to putting that faith in action! However you put your faith in action, know that it is deeply appreciated. I believe Cold Spring Church’s mission can achieve an even greater impact in our community as we work together! What will you do today to make your faith real?